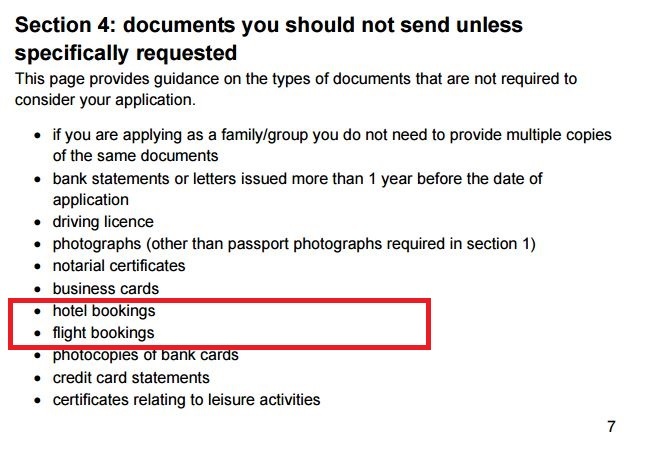 Chance of getting UK Standard Visitor visa without booking flights for application? Can anyone let me know if they have experience of someone who has applied for a UK Standard Visitor visa and had EVERYTHING in their application except flight bookings? Refused or accepted - anything at all. My boyfriend has just applied for a UK Standard Visitor visa for a two week period and has proved ties in his country, proof of employment and holiday time, proof of theatre and excursion ticket bookings in the UK, train journey tickets in the UK, proof of address, his bank statements, proof of accommodation, two letters of invitation etc; just not booked flights. So has anyone applied like this and been accepted or refused or do you know someone who has? I'm asking to plan for if the application is refused based on flights not being booked. Addendum: Thank you for the response - the question is does anyone have experience of a visa application being made without any flight information and if the application was refused on basis of lack of flight information or they had everything else and it was accepted. The question is not how do I book a flight without paying for the purpose of application or what do I need to put in the application, apologies if that was unclear. As I said, the application has already been made and I am asking to make a contingency plan if necessary and considering most realistic outcomes by trying to find out if anyone has had a similar experience. There has never been a refusal based upon the absence of flight bookings. Moreover, I don't know of any practitioner who has represented a refusal based upon the absence of flight bookings. Flight bookings stopped being required under the first John Major government about 23 years ago. The Foreign Office ran an advisory on their site until the reorganisation in 2010, and now the advisory is on the UKVI site. ...and here opinion divides as to whether or not "any other appropriate document indicating the envisaged travel plans" other forms of evidence are permissible. This depends upon the status of the applicant. Applicants who have reached 'bona fide' status based upon their performance history will have no problems. However, I represented a Schengen application for a first time applicant and simply included an Excel spreadsheet showing what the plans were. I have not seen a validated Schengen refusal based upon the absence of flight tickets. ...they want to see an itinerary and says nothing about bookings. This covers 95%+ of the questions we get here on Travel.SE; if your application is for a country not covered here, you will have to identify it explicitly. Based upon what you wrote, you are experiencing "post-submission anxiety". This generally occurs after a person has submitted their application and then begins to surf the net. They read some horror stories and flip out. They then start posting panic enquiries on various forums. Lots of times their postings are not lucid or complete, and they get crap advice as a result. The internet is a very poor remedy for 'post-submission anxiety'. Addendum: I know there are lots of tales out there where people claim to have been refused because of flight bookings, but when you read the actual refusal notice, their problems were much more fundamental. The policies listed above all have to do with the application stage, i.e., the point at which a visa application is submitted and decided upon. When things progress to the arrival and landing stage (i.e., the point at which you actually arrive in the destination country), you will absolutely need to have on hand confirmed, bought and paid-for tickets to your onward destination. There is a good likelihood you will be asked to show them to the officer who lands you and there's no scope under any of those regimes for not having paid-for and definitive onward travel arrangements. The need for onward travel arrangements at the arrival and landing stage is across-the-board. It means whether you need a visa or not, if you don't have tickets for leaving the country you will be in trouble. Depending upon your personal impact and articulation skills, open-ended tickets might work, or they might not. Those details are within the IO's discretionary range. Otherwise, the need is for concrete, paid-for tickets (along with the credit card details used to pay for the tickets so they can cross-check it if they want, and yes, they have the credit card details in their database). can i apply for UK family visit visa in India with only one way ticket? UK Standard Visitor visa refusal. Should I reapply? Will missing an interview for a US visa keep me from getting a UK visa? How do I complete a Standard Visitor visa application form for children under 10 years? UK Standard Visitor Visa: how long does it take to get application acknowledgement?